The obituary for Magdalen Parker Mileski, written and published after her death on May 11, 2007. 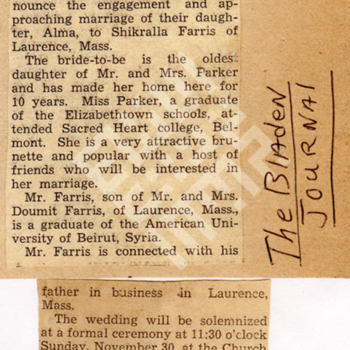 The marriage certificate issued to Alma Parker and Shikrallah Doumit Farris in 1941. Shikrallah Doumit Farris' certificate of naturalization, issued in 1945 after his marriage to Alma Parker of Elizabethtown, North Carolina. The death certificate of Shikrallah Doumit Farris, who died of coronary thrombosis on August 21, 1964 in Elizabethtown, North Carolina.